I have called this blog The Sound of Pain to express my sadness at the events that transpired here yesterday. A quiet day in the river valley was shattered with the sound of chainsaws, the crashing of trees, and the grinding whirring engine of the bulldozer. Just behind the house a whole area was being cleared for development. I watched as the birds looked on, askance, at their trees disappearing into the earth. The river provides a place of beauty and tranquility, a real contrast to the pandamonium that transpires when developers make place for new housing by destroying the housing of animals, birds and insects. In the past few weeks, all round this area, the sound of the chainsaw has not been far away. Trees are making way for new housing and the whole area is undergoing a massive transformation as old houses are demolished for appartment living. The bush turkeys still walk up and down the street looking for food and digging up the front garden. And at night I hear the bats chatting and sqwark-a-ling, but the trees that were their blossom providers as well as food and home for possums and other creatures have been torn away, and the heart of the earth is in pain, like my own. Yesterday was just the first of many days to come of the sight and and sound of painful devastation. To cope with this sadness for the madness, I seek solace in the inspirational words of Wendell Berry, in his poem 'The Peace of Wild Things'. The pain of suffering of human and earth often acts as a catalyst for people to become more aware of social and environmental injustices. Witnessing environmental destruction as an adult or child has beern the impulse for action, as if the grief of feeling the earth's pain becomes the motivation for trying to ease any future suffering. When sacred places like the homes for small creatures are destroyed, when people catch their first glimpse of clear felling, when they, like the founder of Sea Shepherd look into the eye of the just harpooned, now dying whale, their grief overflows. Environmental carer Joanna Macy balances the depths of grief and despair with action and ritual. 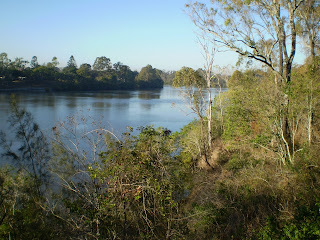 Recently I took part in a Council of All Beings ceremony right on the edge of the Brisbane River. In this ritual, we give voice to the being and species who have been silenced by environmental despair. We don masks of other beings, animals, plants, birds, elements, insects, fish, coral reefs, forest moss, trees, and one by one, in the guise of our chosen 'being', we speak out on behalf of, and as the animals, expressing our sadness at what humans have done,and are doing, to the precious and sacred environment. The paved-over and over-logged society has forgotten its inimate connection with the natural world. We are nature but we need the otherness of nature to remind us of our human-ness. This is at the heart of the second part of the Council of All Beings ritual. After sharing our sadness, even outrage at what humans have done to the sacred land and sea, we stand in circle and one my one, still in the guise of our chosen being, we offer our quality, our character, the sense of our identity, to the human. Qualities of tenacity, of aliveness, of laughter, of dance, of beauty, of vision and wisdom. Then we dance our connection with the beings. Us as nature, with nature, dancing in partnership, being inspired and in-spirited. The Council of All Beings ritual helps us learn to listen, and to hear with a different hearing, to speak with a different voice, to feel and declare with words, the songs and dances embedded in the land, the rivers and the oceans. Gary Lawless says it simply in his moving poem, 'Earth Prayers'. will we know what they are saying? will we be able to answer them? will we be able to wake ourselves, and act? If you would like to add a comment, click on 'Comment' just below. Berry W, 1985, Collected Poems, New York, North Point Press. Whitney D, 1995, 'Spirituality as an Organizing Principle,' in World Business Academy Perspectives, 9, 4, 51-62.